This is the first release of the game Rocket Rider VR. It was a mini-game that we came up with during VR Brain Jam at the 2017 Games for Change Festival. We’ve decided to develop this further and polish it further for release. It is currently available on our itch.io page and currently in the process of getting put up on the Steam store. Rocket Rider VR places the player on top of a rocket, blazing through an asteroid belt, riddled with cosmic storms, all for your enjoyment. Made to test the player’s Cognitive Shift cognitive function; to redirect one from one fixation to another, all while racking up your highscore! 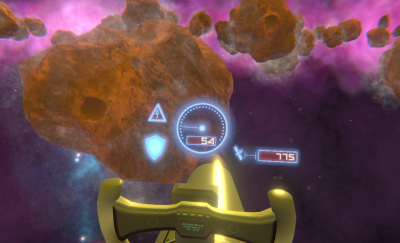 Climb aboard the “Rocket Rider VR”, an endless “Rider” where you will race through a never ending stream of asteroids and nebulas. 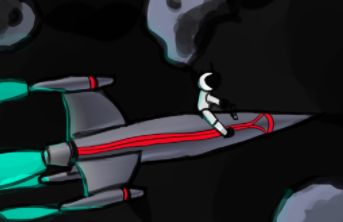 Pilot your craft down the infinities of space, gaining speed as you deftly dodge the debris of the cosmos. Slow yourself down with near misses, or go Pedal to the metal and tests your skills at high speeds. Challenge your cognitive function to “shift”, as raging nebulas fry your controls, and make even the most veteran of rider’s mistake their left for their right. Go for the highest speed to maximize your distance, but be warned, navigation at high speeds may be tricky! 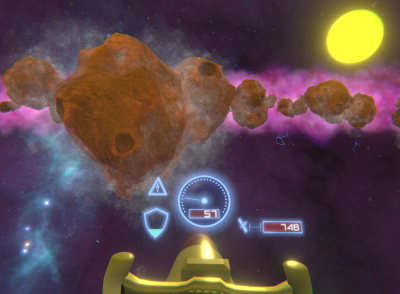 Race through never ending asteroids belts while adjusting your speed to keep you alive. Challenge your working-memory’s “Shift” cognitive function with controls that constantly flip.